I was awarded my Ph.D. degree in 2014 (in Biomedical Engineering, Biomaterials and Tissue Engineering) from University of Sydney. My research group is investigating cell-biomaterial based strategies for musculoskeletal tissue regeneration and their application in the clinical translation of orthopaedic medical devices. This research technology platform involves 3D Biofabrication and additive manufacturing of biomaterials and medical devices applied to regenerative medicine of bone and development of novel nanocarriers and bone grafts to promote bone healing or treat bone diseases. Throughout my career, I have developed several novel biomaterials for the treatment of large bone defects, osteochondral defect regeneration and for stabilisation of metallic implants. I was fortunate as an early career researcher and the main inventor, to translate an innovative bioengineering technology from the laboratory bench through to successful commercialisation of a tissue engineering product. This product, a novel synthetic bone graft, Sr-HT-Gahnite, has been exclusively licenced globally by an Australian orthopaedic medical device company, Allegra Orthopaedics. Allegra was awarded $1.6M from the NSW Government Medical Devices Fund in 2015 to bring this technology to market. My achievements have been recognised through receiving of the Australian National Health and Medical Research Council (NHMRC) Early Career Fellowship for funding in 2016–2019. In 2017, I moved to University of New South Wales, School of Chemistry as a research fellow to work closely with Scientia Professor Justin Gooding and establish a Biomaterials Design and Tissue Engineering lab. Cell-instructive and cell-responsive biomaterials (the aim is to develop a unique approach in building biomaterials that are cell-instructive and cell-responsive. This can create a selective and dynamic feedback loop between a cell and the microenvironment). Gene activating scaffolds (The aim of this study is to develop a new generation of 3D constructs that can host cells in a 3D dimensional environment and are able to deliver biomolecules into the cells). New generation of bioceramic, bioactive glasses and bone cements for musculoskeletal tissue regeneration. Development of universal methodologies to test efficacy of biomaterials; replacing the conventional methods. Printing complexed shaped inorganic based tissue scaffolds for tissue engineering applications. Synthesis of new generation of bioceramic, bioactive glasses and bone cements for musculoskeletal tissue regeneration. Development of biomaterials as synthetic tendon, skin and treatment of cardiovascular disease. Biomaterials for neural regeneration (material effects on cell behaviours such as proliferation, differentiation, directed neurite growth, and tissue function). 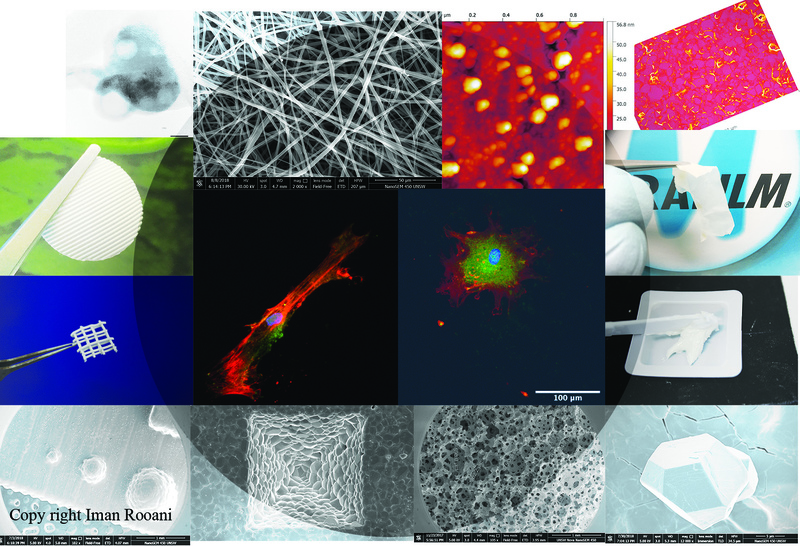 An exhaustive investigation on Biomaterials-microstructure-protein/cell interactions. 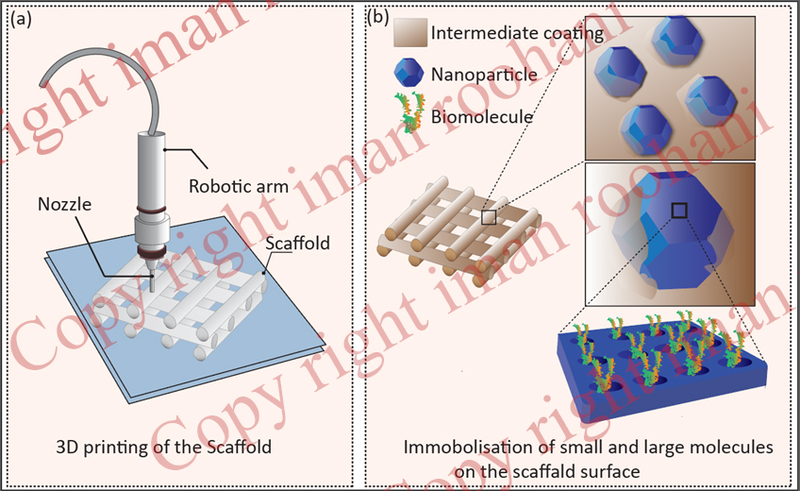 Surface coating strategies for medical implants and tissue scaffolds. Designing load bearing scaffolds for treatment of segmental bone defects. Synthesis and fabrication of multifunctional calcium phosphate nanoparticles. Bone-ink is the first printable bone bioactive material in aqueous media with high-fidelity printing ability in my group. The “bone-ink”, in the form of a ready-to-use and mouldable paste with long shelf-life which can be 3D printed to construct porous structures in aqueous media without using high temperature or radiation. The bone-ink is biocompatible, mimics the bone extracellular matrix and can be combined with sensitive biomolecules and cells without impairment of their biological activity. Due to its optimised viscoelastic property, bone-ink can be utilised to simply fill in the bone defects via minimally invasive procedures or obtain patient specific bone grafts by a conventional 3D printer. Bone-ink can also be mixed with aqueous components, for e.g. drugs or growth factors or autologous biological fluids (blood or bone marrow aspirate). The main challenges in hindering successful use of ceramic scaffolds in repair of large bone defects remain to be poor (and unpredictable) adsorption and retention of bioactive molecules (osteoinductive or angiogenic) by scaffolds that leads to its rapid clearance from defect site thus requiring supera-physiological (at least a few mg) doses that raises concern regarding cancer risk and ectopic bone formation. The other issue is related to short half-life of those molecules in vivo, in which results in an unexpected low bone regeneration outcome. We have developed a technique in which enables us to immobilise the bioactive molecules to the ceramic surface without impairment of their biological activity and sustainable release to the defect site. The bone microenvironment is fertile ground for tumour growth.The cooperation between tumour and osteoclasts forms the vicious cycle of bone metastasis.Bone is a favourable microenvironment for tumour growth and a frequent destination for metastatic cancer cells. Bone metastases are predominant in advanced breast (70%), prostate (70%), thyroid (60%), lung (35%), and kidney cancer (22%). We are working on development of novel nanocarriers to address diseases related to musculoskeletal system. Ideally, bone scaffolds should be biocompatible, degradable, mechanically strong (with comparable mechanical properties to bone tissue) and be able to provide enough interconnected pore space (porosity) for tissue in-growth. The major bottleneck in development of load bearing bone scaffolds is the insufficient mechanical strength at high porosity that is essential for tissue in-growth. Generally, scaffolds fail in-vivo because they undergo substantial dynamic and complex forces during surgery and post-implantation that results in implant instability and termination of healing process. Currently, there are no degradable and load bearing scaffolds available for orthopaedical applications with the majority of bone substitutes are in the form of granules, powders or putties with the limitation of use only for treatment of small defects. We utilise computational modelling and additive manufacturing techniques to develop and design modular scaffolds to be applied in load bearing scenarios without using metallic components that are inert and do not integrate or have slow integration behaviour. We are interested to understand and decode the interaction between synthetic materials as the pillar of regenerative triangle (biomaterials, cells, bioactive factors) and cells involved in healing process of body tissues to develop novel biomaterials. We explore the effect of chemical, mechanical and physical cues from nano to microscale, from synthetic materials on behaviour and biological functions of cells. 2018-2020 Roohani-Esfahani (sole CI), A Targeted Drug Delivery System for Treatment of Bone Metastasis. NHMRC project grant; AUD $243,607.00, Australia. 2018-2020 Roohani-Esfahani (CID), Optimising bone regeneration using advanced design and fabrication technologies. NHMRC project grant; AUD $916,671.00, Australia. 2019-2020 DAAD German Academic Exchange Service; Gooding (AU), Roohani-Esfahani (AU), Balmayor (DE) and Poh (DE); Spatiotemporal Delivery of Chemically modified RNA with a Novel Sinterless 3D Printed Ceramic Scaffold to Treat Large Bone Defects. 2014-2016 Roohani-Esfahani SI (CI), Han L (AI), Steck R (AI) and Zreiqat H (AI). Architecturally-controlled synthetic bone substitutes for bone regeneration under load. AO Foundation Start up Grant; AUD $95,000, Davos, Switzerland. 2015-2016 H Zreiqat, Roohani-Esfahani. The Cellular-Scaffold Interface unravelled: Advanced Multiphoton-Imaging to optimize Bone Tissue Engineering using novel mechanically strong, tough and bioactive 3 D printed Ceramics Biomaterials scaffolds, Group of Eight/Germany Joint Research Co-operation Scheme. 2014-2016 K Spiller, Roohani-Esfahani SI, H Zreiqat. Research planning and proof-of-concept study of macrophage-scaffold interactions. US National Science Foundation, CNIC (Catalysing New International Collaborations) scheme; USD $70,000. 2014-2015 Roohani-Esfahani SI. Early Career Researcher Development Scheme, University of Sydney; AUD $44,000. 2018 Fresh Science Recipient NSW. 2018 Australian & New Zealand Orthopaedic Research Society Travel Award. 2017 Excellent Research Contribution Award and Travel Award, 6th Int`l Conference on Tissue Engineering/3rd Int`l Conference on Regenerative Biomedical Materials, Crete, Greece. 2016 NH&MRC Peter Doherty Biomedical Early Career Research Fellowship. 2016 Dean’s Research Excellence Award, Faculty of Engineering and IT, University of Sydney. 2016 Selected as TERMIS-AP SYIS advisory committee member in Taiwan out of international applicants. 2015 Selected Tissue Engineering Young Investigator Council, Tissue Engineering Journal, USA (over 450 world-wide applicants). 2014 Outstanding Young Investigator Award in Tissue Engineering and Regenerative Medicine, South Korea. 2014 Australian & New Zealand Orthopaedic Research Society Travel Award. 2014 Outstanding Reviewer of the Journal of Materials Science and Engineering Materials for Biological applications. 2012 Research Excellence 1st Award for outstanding PhD research achievement, University of Sydney. 2012 Australian & New Zealand Orthopaedic Research Society Travel Award. 2012 Runner Up for Excellence in Innovation Award at Research Conversazione, University of Sydney. 2011 Best Postgraduate Poster Presentation Award in the field of Biomedical Engineering, University of Sydney. 2011 Runner Up for outstanding graduate student, WFRIM young investigator award, Tissue Engineering and Regenerative Medicine-North America, Texas, USA. 2011 Sydnovate 1st Award for Excellence in Innovation at Research Conversazione, University of Sydney. 2011 Australian & New Zealand Orthopaedic Research Society Travel Award. 2011 Finalist of Engineering Award Australia. 2010 Sydnovate 1st Award for Excellence in Innovation at Research Conversazione, University of Sydney. 2010 Australian & New Zealand Orthopaedic Research Society Travel Award. 2010 Best Postgraduate Poster Presentation Award in the field of Biomedical Engineering, University of Sydney. 2010 Biomaterials and Tissue Engineering Postgraduate Research Scholarship, University of Sydney. 2006 Received an award (1,500 US$) as a fulfilment grant for master’s degree Project and research and innovation in the field of nanotechnology from Iranian Nanotechnology Initiative. 2001 Talented Bachelor Student, Isfahan University of Technology.